I can't believe Mother's Day is less than two weeks away! This time of year is always really busy for us, and this year is no exception, so we are really looking forward to spending some time at home with our families over Mother's Day Weekend! 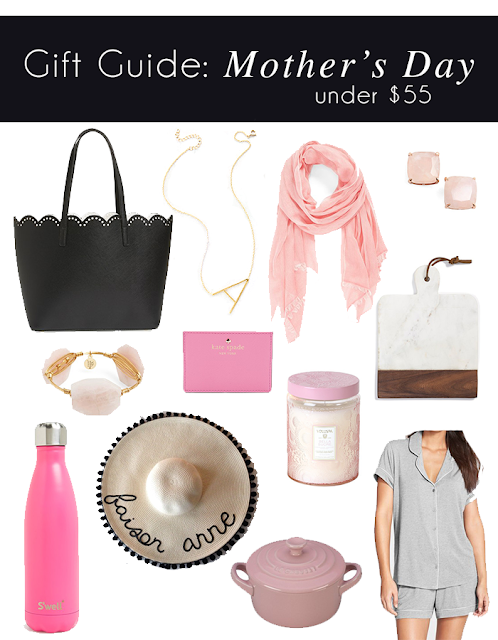 I'm working on a fun post that's all about an activity you can do with your mom, grandmother, or any other special lady in your life but I wanted to stop by today and share a gift guide with fun little things for mom under $55. This hat has been on my own wish list for a while, and is perfect for anyone because they have an option where you can customize it to say any phrase in any color! Whether you like to go the homemade route or spoil your mom by splurging on her Mother's Day gift, I hope you have the chance to spend some time with her!